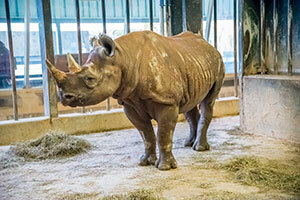 The Milwaukee County Zoo recently welcomed a new Eastern black rhino to its collection. The 4-year-old female, Janine (nicknamed Jozi), was transported to Milwaukee from the Pittsburgh Zoo on October 28. She will be quarantined for 30 days in the indoor Rhino Exhibit and will have access to the outdoor exhibit once quarantine is complete, if temperatures are warm enough. Once that occurs, Jozi will be on exhibit in her own yard in the outdoor display, next to the yard of the Zoo’s resident rhino, Mimi. Although Jozi may not be outside until spring, visitors will be able to see her through normal winter viewing of the rhinos, in the indoor exhibit. The Zoo may breed Jozi in the future. The Zoo’s current rhino, female Mimi, is a South-central black rhino. Jozi is an Eastern black rhino, a different subspecies of black rhino out of three total. Jozi’s primary zookeeper at the Pittsburgh Zoo comments that she’s an enthusiastic animal, and enjoys working with and learning from her keepers. Her favorite enrichment items are Weebles (bottom-weighted toys) that she can push around and watch pop back up, logs and tree branches with leaves. Favorite foods include pumpkins, watermelon, cantaloupe and romaine lettuce. Jozi responds to different training techniques, and will open her mouth and walk backwards, both from the direction of her keepers. She weighs 2,100 pounds and has a bit more growing to do, as female black rhinos are considered mature at 5-6 years old. The Association of Zoos and Aquariums (AZA) manages only the Eastern rhinos, while the South-central subspecies is managed by the International Rhino Foundation (IRF). The Milwaukee County Zoo is one of very few AZA facilities with South-central black rhinos in its collection. The Zoo’s addition of an Eastern black rhino is based on the availability of rhinos, the fact that the AZA population requires additional spaces, and the directions and needs of the AZA and the IRF. Black rhinos are critically endangered primarily due to illegal poaching resulting from the commercial demand for rhino horn. Please consider purchasing an International Rhino Keeper Association 2017 Rhino Conservation Calendar here. All proceeds help support the International Rhino Foundation and the South African organization, Stop Rhino Poaching.